While the major non-American Western oil companies adopt and wait-and-see policy and US firms remain barred by Washington’s sanctions, shadowy oil enterprises are gaining footholds in Burma. Among firms which have recently won licenses to explore for oil and gas are little-known businesses based in Panama, Nigeria and Azerbaijan—countries where corporate accountability can be murky. Not only does the bidding process remain opaque, the pedigree of some of the participants is too. CIS Nobel Oil Company claims to be London based, but on investigation its only contact address is in Baku, capital of Azerbaijan, a former republic of the Soviet Union on the Caspian Sea. 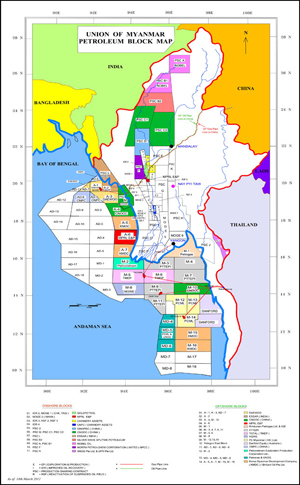 Nobel is to prospect for oil and gas on an unnamed onshore block awarded by the Burmese Ministry of Energy. Virtually nothing is known about Nobel other than that it does some prospecting in the Caspian Sea and has links with Azerbaijan’s state oil company. Nobel and a clutch of other little known firms bid for licenses when the ministry put forward 18 onshore blocks for development last year. A firm registered in the Central American country of Panama called Geopetrol International Holdings secured a license for another block which it will operate with Burmese partner A-1 Mining Company. Panama is notorious for providing so-called flags of convenience for murky shipping companies which do not comply with international safety standards and regulations. Burma’s Energy Ministry has also awarded a license to a firm called Tianjin New Highland, which appears to be Chinese but has links in the unstable African state of Nigeria, noted for its “black gold curse”—the political and business corruption around its oil wealth which has left millions of Nigerians in poverty. Tianjin New Highland appears to have begun life in Hong Kong but is registered in the money laundering tax haven of the British Virgin Islands in the Caribbean. It also operates under the name Tianjin Energy Resources. “These are by no means mainstream oil businesses and the ownership of some of them is rather lost in the web of addresses and registrations,” said an industry analyst in Hong Kong who did not wish to be identified. Geopetrol already operates some form of joint venture with Goldpetrol, a subsidiary of Interra Resources of Singapore, which actually has links with Indonesia. Confused? These webs can be extensive, leaving anyone seeking information on ownership confused and bemused. Another little known Indonesian firm, Istech Resources Asia, has been named by the Burmese Energy Ministry as being successful in obtaining an onshore license, although it appears a local partner is still being arranged. Under new rules, all foreign oil and gas firms starting up in Burma from now on must take on a Burmese partner. For reasons that have not been explained, only nine of the 18 onshore blocks offered last year have been awarded, and only four of those had, up to last week, completed development agreements. Local firms named in these partnerships so far are Aye Myint Khine Company, A-1 Mining Company, and UNOG. UNOG Pte Ltd is registered in Singapore but is run from Burma. Oil industry data names Win Kyaing as managing director. He is also linked to another firm called IGE. Some equally obscure foreign firms are already in operation in onshore blocks in Burma, with names such as Silver Wave Sputnik Petroleum and Zarubezhnet Itera, with vaguely Russian connections. Sputnik Petroleum says it is registered in Singapore, while its sister company Silver Wave Energy leads back to the small Russian republic of Kalmykia on the Caspian Sea. Zarubezhnet Itera has links with the Russian state in Moscow. Only two major international oil firms took up offers in the last license bidding round. These are Petronas of Malaysia and PTTEP of Thailand, both state owned and both already engaged in Burma’s oil and gas industry. “The apparent lack of interest from major players was surprising, although last year’s bidding round took place before big changes like Aung San Suu Kyi being elected to Parliament and the EU suspending its sanctions,” analyst Collin Reynolds in Bangkok told The Irrawaddy on May 8. Another batch of onshore development blocks will be put up for sale in August, the Energy Ministry’s director general of planning Htin Aung said last week. A batch of offshore licenses will be offered by the end of this year, he said. Industry giants such as Chevron, Total, Shell, Nippon, CNOOC and Mitsubishi sent representatives to the March trade show in Rangoon organized by the Ministry of Energy to promote development. The ministry’s Htin Aung told the show’s participants that Burma has “proven” oil reserves of almost 140 million barrels and 322 billion cubic meters of gas. Raising that volume of hydrocarbons from beneath land and sea is going to require large and long-term investment—much more than the likes of Silver Wave Sputnik Petroleum, Nobel Oil and GeoPetrol can muster.